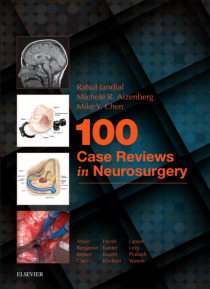 Jandial's 100 Case Reviews in Neurosurgery is the only reference offering a comprehensive approach to effective preparation for oral examinations, MOC, or grand rounds. Ideal for residents and graduates alike, it covers 100 of the most commonly encountered neurosurgical cases and presents them in a layout mirroring that of the oral exams. This singular resource eliminates the need to consult sever… al texts, providing readers with all of the complete, concise knowledge needed to go in with confidence.Covers 100 of the most commonly encountered neurosurgical cases on oral exams.Highly templated format mirrors that of the oral exams and ensures quick and easy navigation.Over 500 illustrations ensure an enhanced visual understanding.Provides a chapter on endovascular neurosurgery, a topic newly included on oral exams.Features robust sections and art on the challenging areas of peripheral nerve surgery and vascular surgery.Includes common questions on complication management.Appendices with key neurosurgery tables and figures (e.g. positioning, spinal fracture grading, and neuropathology) facilitate quick review.Information is backed by evidence when available.